If you’re stocking up on spices for all of those delicious Fall recipes, don’t forget to add saffron. Known as the ‘queen of all spices,’ saffron has a unique flavor that’s hard to forget -- perhaps that’s why authentic saffron is so hard to find. Fortunately, Keith Alaniz -- along with co-founders Kimberly Jung and Emily Miller -- brings saffron from the Middle East straight to your front door with Rumi Spice. Dodging roadside bombs in the back of a Humvee, Keith Alaniz kept looking through the fields of purple flowers. 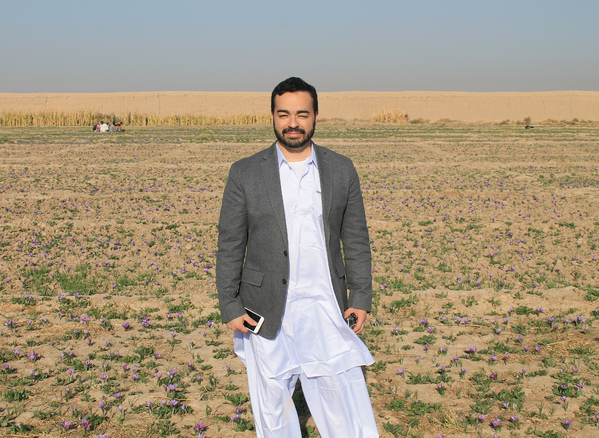 Alaniz thought it was surreal to see so much beauty in war-torn Afghanistan; but at the moment, he was just enjoying the view -- little did he know that those same purple saffron blossoms would come to define his career in the future. So Alaniz called his old friends Emily Miller and Kimberly Jung, both Army veterans who had served in Afghanistan, and shared his idea with them. At the time, Miller and Jung were attending Harvard Business School. After some discussion the three agreed to start a saffron supply and distribution business. Inspired by the 13th-century Persian poet, Jalal al-Din Rumi, they named their company Rumi Spice. It’s true. In fact, there’s so much interest that you can already find Rumi Spice’s products at your nearest Whole Foods. Alaniz says he’s proud of the fact that it’s the first Afghan product launched in the United States -- but he’s even more proud of the impact his company has made for Afghan farmers. As both a social enterprise and for-profit business, Alaniz focuses on doing what’s best for both Afghan farmers and Rumi Spice. While some may argue that it’s hard to balance both aspects, Alaniz says he follows a mantra whenever there’s a dilemma between community and company. And speaking of doing well, Rumi Spice is currently the leader of all saffron distribution coming from Afghanistan. What’s more, the company has also helped dozens of Afghan farmers increase their yearly wages by 400 percent. With one success after another, it was only a matter of time before some well-known investors took interest in Alaniz and his team. It was that very mission that caught the attention of billionaire entrepreneur and investor Mark Cuban. After some negotiation, Alaniz and his co-founders walked off the set of Shark Tank with $250,000. Along with Mark Cuban, Rumi Spice has had a number of backers along the way including Bunker Labs, a nationwide business incubator for veteran-owned startups, and Chobani, the nation's top Greek yogurt brand. And though Alaniz is grateful for all the support he’s received in recent years, there’s one group that continues to stand out. 1871 provides work space, education, resources, and curated connections to help Chicago's entrepreneurs build and scale their business.